Cloudy and a cold wind but the rain kept off. Two buses to Westminster and to St John’s Church Smith Square. Had no ticket but being very early before 10 – I was let in up in the Gallery of the Church and sat over the Chancel and in front of Mrs Pankhurst’s Coffin. The flowers were marvellous – most beautiful. A wonderful service but very sad – sad in itself and to see & feel us all so old and grey and ill. A bus to Brompton Cemetery an enormous crowd there. Followed the Coffin and saw the end – then got away. That occasion, fittingly enough, marked the end of Kate’s involvement with the women’s suffrage campaign. Kate, whose years as an active suffragist are faithfully recorded in her diary (published as Campaigning for the Vote: Kate Parry Frye’s Suffrage Diary) made no mention in her diary of the passing a couple of weeks later – on 2 July – of the Representation of the People (Equal Franchise) Act. It was as though, with the death of Emmeline Pankhurst, a chapter in her life had closed (though you can find out very much more about her life before and after suffrage in Kate Parry Frye: the long life of an Edwardian actress and suffragette). I was thinking of Kate on a deliciously dank autumn morning last week when I found myself in the neighbourhood of Brompton Cemetery and thought I mustn’t let the opportunity pass to walk yet again in her footsteps. 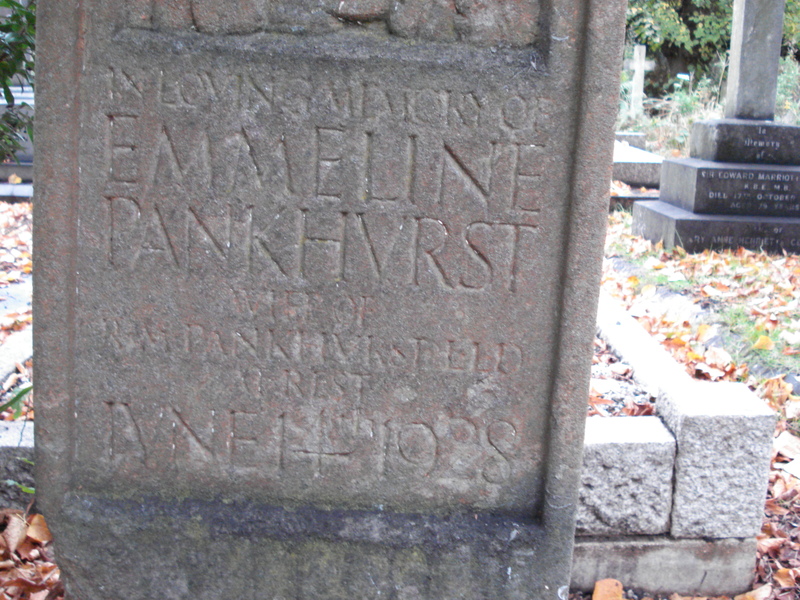 I had visited Mrs Pankhurst’s grave some years ago – but that was before I had encountered Kate Frye and before the day of the digital camera – or blogs. Now I imagined Kate there, among the large number of women who crowded around on that windy way. Confined to the paths, most could have seen little of the ceremony. I’m not sure that Kate returned to the Cemetery so doubt that she ever saw the headstone that was erected some time after Emmeline Pankhurst’s burial. The grave is easily found – on the left-hand of the central path, encountered soon after you’ve passed through the imposing North Lodge (Old Brompton Road) entrance. It was also one of the very few graves at which flowers have recently been left. I suspect that such tributes are regularly made and, needless to say, as you will see from the photo, they are likely to approximate WSPU colours. 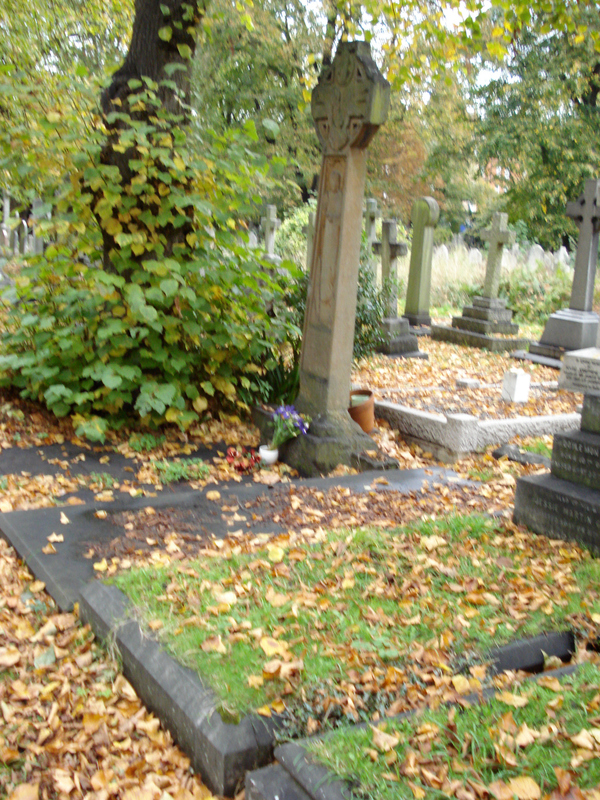 The tall headstone is sloping slightly – although perhaps not as much as my photography suggests! 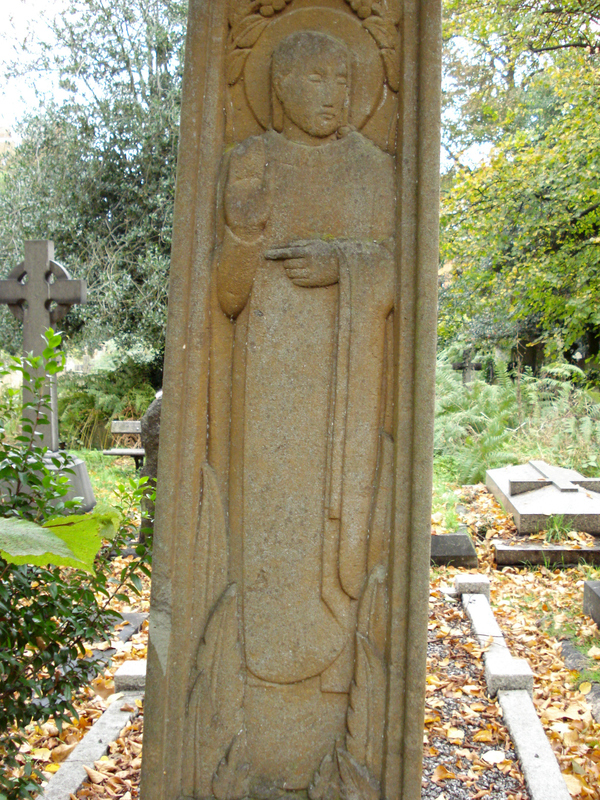 As I quote in the entry on Emmeline Pankhurst in my The Women’s Suffrage Movement: a reference guide, the headstone was ‘designed by Julian P. Allan, whom Kitty Marshall described as “a clever girl”.’ When researching (in pre-internet days) for that book (published in 1999) I had neither the time nor, indeed, the resources to attempt to discover who this ‘clever girl’ was. Now a little digging has produced her intriguing story. Julian Phelps Allan was born Eva Dorothy Allan in Hampshire in 1892 – so ‘the clever girl’ was actually 36 at the time of Emmeline Pankhurst’s death. After the registration of her birth we next catch sight of her nine months later as she sets sail with her mother (‘Mrs Allan’) and her brothers, 5-year-old Leonard and 3-year-old Cecil, bound for Belize. Well, of course I immediately wondered why they were making that journey and set out to explore all the various databases that might prove useful. I slowly pieced the answer together. They were returning to British Honduras where Mr Allan – Gordon Allan (1856-?) – was surveyor-general. In 1885-6 he had published ‘A Plan of Belize’. Further research uncovered his marriage in 1884 in west London to Ada Phelps Richards, the eldest in the large family of a widowed brewer. Before taking over the family firm her father had been a civil engineer and Ada had been born in Brazil, presumably when he was engaged on some south American scheme. I suspect that Gordon Allan died in the 1890s in British Honduras because I next found his son, Cecil G. Allan (who had been born in British Honduras) in 1901 as a pupil at the London Orphanage Asylum at Watford. The criterion for admission to that establishment was that the pupil had to be fatherless – but not, apparently, motherless. For in 1911 Ada Phelps Allan was still alive – a patient in the Merchant Taylors’ Convalescent Home for Ladies at Bognor. Indeed she did not die until 1944. In 1911 her daughter, Eva, was boarding in the home of carpenter and joiner at 40 Achilles Road, West Hampstead. The census recorded her as ‘student at college’. Her landlady’s daughter was a student at Clark’s College so perhaps that was where Eva also was studying. It was an appropriate educational institution for a young woman of her background – and, probable lack of means – to attend. Clark’s very successfully trained young men and women to pass the Civil Service examinations. I can imagine – though don’t know for certain – that Eva spent the following few years working efficiently in offices – until she became a member, during the First World War, of the Women’s Army Auxiliary Corps. She served as a ‘unit administrator’ – the equivalent of officer rank. After the war she studied sculpture at the Westminster School of Art and then at the Royal Academy Schools. You can read an account of her work as a sculptor here. The commission for Mrs Pankhurst’s headstone came early in her career. Doubtless she moved in circles that overlapped with those of suffrage activists. It was also around this time that she dropped ‘Eva Dorothy’ in favour of the more androgynous ‘Julian Phelps’ (‘Phelps’ being her maternal grandfather’s second name – and a name inherited by her mother and most of her mother’s siblings). 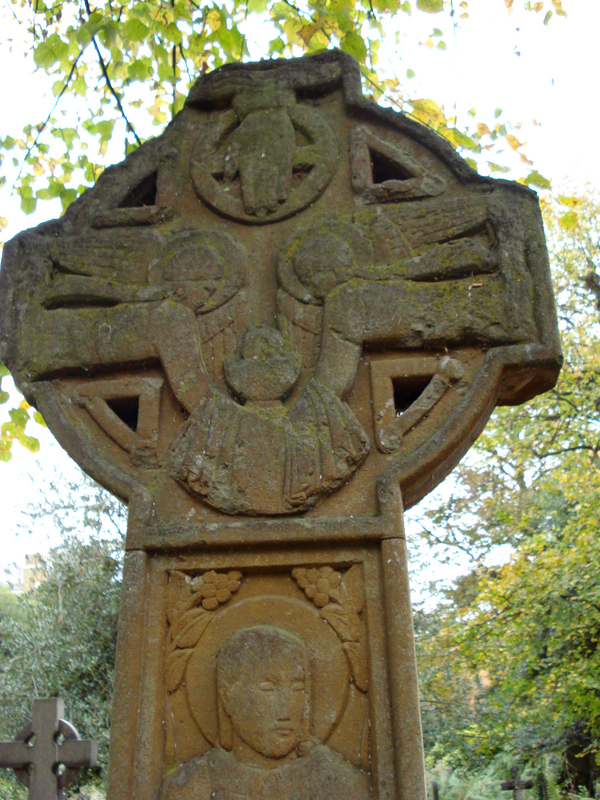 The headstone she made for Emmeline Pankhurst is of red sandstone, in the form of a Celtic cross. 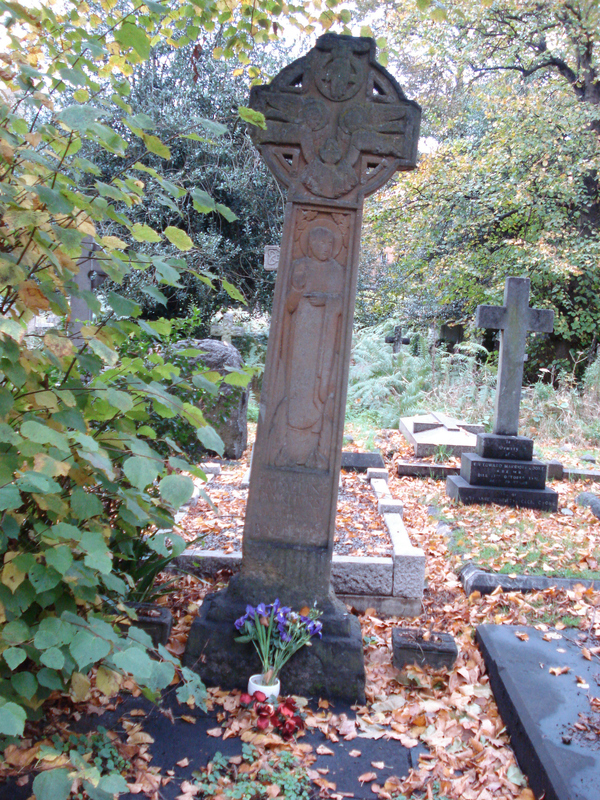 The inscription is simple – ‘In Loving Memory of Emmeline Pankhurst wife of R.M. Pankhurst LLD At Rest June 14 1928.’ No mention of children, or a life’s work for women. The shaft carries this somewhat enigmatic haloed figure. The head of the cross shows what I take to be the hand of God reaching down from the heavens as two angels minister in some symbolic way. I wonder how the commission was described in the brief to the sculptor? See here for Julian Allan’s own – very different – memorial. I’m rather amazed to discover that she was actually still alive when I first came across her name – researching The Reference Guide She died in 1996 – aged 103. This entry was posted on October 27, 2014, 9:29 am and is filed under Suffrage Stories. You can follow any responses to this entry through RSS 2.0. You can leave a response, or trackback from your own site.